Do you ever go through a period of time when you want to make everything? I always have a running list of projects that I want to make. Sometimes I have specific plans, and other times I simply have a general idea of what I want to do with certain materials. These days I want to make every project — now. This has been an unusual year for us. First, a lot of my materials and supplies were packed away in preparation for moving. Then it became a matter of unpacking and reorganizing the lot, which of course meant revisiting items that sometimes I didn’t even remember I had. Now that I have access to everything again, all of the projects have made it to the top of the list. The project that has done the best job of claiming my attention is cleaning my great-grandmother’s Singer treadle sewing machine and the contents of the drawers, which I introduced last week. That may be in large part because the cabinet is currently sitting in the middle of the living room. All of the buttons have been washed; they were dirtier than I expected. I’ve soaked the random pieces of string and they’ve whitened considerably. I waxed the wooden cabinet, and am about halfway through waxing the cast iron. I’ve been surprised by how much extra dirt the wax takes off. It’s been a challenge to get into every nook and cranny, but I’m doing my best to access every spot that I can. The exterior doesn’t look much different, but the wax really brought the drawer interiors and undersides back to life — not that anyone else is likely to notice. The same drawer, before and after waxing. Notice the interior on the right has a warmer color. I was able to download an English version of the instruction book from the Singer website, which will make my life a lot easier when I’m ready to work with the machine itself. I’ve done more research on the model, as well as how to clean the mechanics of the machine. During the past week, I also made a small project. Many years ago, my aunt passed along some heavy home decorative fabric by Waverly called Purdy. Frankly, I’m not a fan of the print. The selvage doesn’t list a copyright date, but the colors lead me to guess that the fabric is from the 1980s. Over the years, I kept coming back to the idea of making a crocheted rug from this fabric. At some point I even started one, but I seem to recall not having access to a large enough crochet hook and I don’t know what became of that version. I cut the remaining three or so yards into two-inch strips and tied them together. With a US-S (19.0 mm) crochet hook and double-crochet stitch, I was able to make a thick rug that’s about 17 inches wide by 22 inches long. I had to add a little denim to finish that last corner! I have to admit, in my head I thought it would end up a lot bigger. But this little rug is the perfect size to go in front of our kitchen sink to cushion our feet and soak up random water drops. 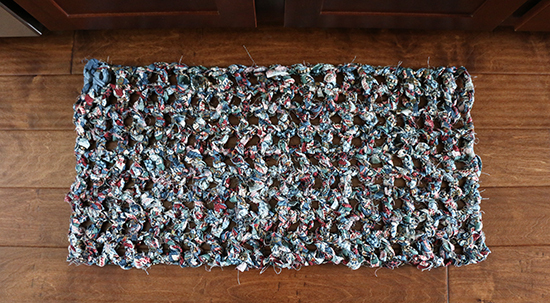 In spare moments, I’ve been going through smaller yarn scraps and knitting squares onto my two scrap blankets. I’ve also been spinning while out and about. While these four items aren’t quite all the projects, they’re a good start. How many projects are catching your attention lately? It's a strange combination of frustrating and fun, isn't it? I'm in the middle of a crocheted rug that is just using odd strips and strings of fabric. Did you fold the 2 inch strips? Mine are not that wide and I am using a smaller sized hook. I just kind of "winging it". I was just winging it also. I tried to fold the pieces wrong sides together, but sometimes the way they were knotted made that a little trickier. I wasn't very fussy about it. Good luck with your rug!